Entertainment on American Airlines is getting even better. Starting Friday (Feb 1st), American Airlines customers will have access to Apple Music to stream more than 50 million songs, playlists, and music videos on any domestic flight equipped with Viasat satellite Wi-Fi. American Airlines is the first commercial airline to provide exclusive access to Apple Music through complimentary in-flight Wi-Fi. No matter how you like to spend your time in the air, there’s something for everyone on American flights. American continues to build a world-class experience and is investing in new entertainment and connectivity options throughout its fleet. In addition to launching Apple Music, American is also: Installing high-speed Wi-Fi on domestic aircraft, with more than 570 aircraft complete, and full completion mid-2019. The company is also adding free live TV on more than 300 domestic and 155 international aircraft, with additional rollouts continuing this year. They are also providing free access to wireless entertainment throughout American’s fleet, bringing great movies and television shows right to each customer’s device. Finally, they’re installing power at every seat on mainline aircraft and two-class regional jets. 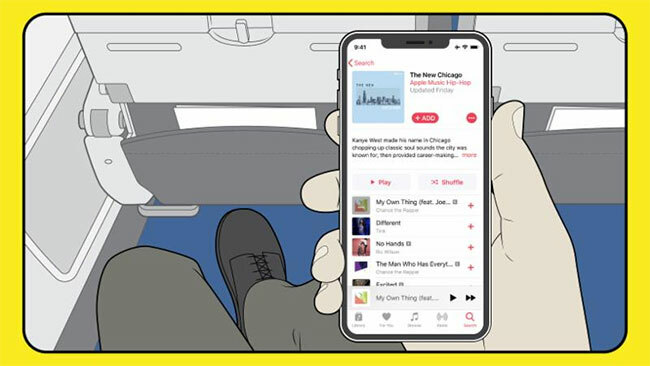 To enjoy Apple Music during flight, customers on Viasat-equipped aircraft can connect to Wi-Fi at no cost and log in with their Apple Music subscription. Customers who don’t already have an Apple Music subscription will also be able to connect to Wi-Fi at no cost, sign-up onboard and receive free access for three months. Apple Music is available on iPhone, iPad, Apple Watch, Mac, Apple TV, PC, Android, CarPlay, HomePod, Sonos, and Amazon Echo. American Airlines customers can enjoy the world’s most exciting new music and unique city-themed playlists for their journey, in addition to Apple Music’s exclusive content such as in-depth artist interviews and today’s hottest sounds on the Beats 1 global livestream.